Şehzade (Prince) Abdul Hamid in 1868. Abdul Hamid II (Ottoman Turkish: عبد الحميد ثانی‎, `Abdü’l-Ḥamīd-i sânî; Turkish: İkinci Abdülhamit; 21 September 1842 – 10 February 1918) was the 34th Sultan of the Ottoman Empire and the last Sultan to exert effective autocratic control over the fracturing state. He oversaw a period of decline in the power and extent of the Ottoman Empire, including widespread pogroms and government-sanctioned massacres of Armenians and Bulgarians, as well as an assassination attempt, ruling from 31 August 1876 until he was deposed shortly after the 1908 Young Turk Revolution, on 27 April 1909. In accordance with an agreement made with the republican Young Ottomans, he promulgated the first Ottoman constitution of 1876 on 23 December 1876, which was a sign of progressive thinking that marked his early rule. Soon, however, he claimed Western influence on Ottoman affairs and citing disagreements with Parliament, Abdul Hamid suspended both the short-lived constitution and Parliament in 1878 and seized absolute power, ending the first constitutional era of the Ottoman Empire. Abdul Hamid's 1909 removal from the throne was hailed by most Ottoman citizens, who welcomed the return to constitutional rule after three decades. Despite his conservatism and despotic rule, some modernization of the Ottoman Empire occurred during Abdul Hamid's long reign, including reform of the bureaucracy, the extension of the Rumelia Railway and Anatolia Railway and the construction of the Baghdad Railway and Hejaz Railway, the establishment of a system for population registration and control over the press and the founding of the first modern law school in 1898. The most far-reaching of these reforms were in education: professional schools were established. The University of Istanbul, although shut down by Abdul Hamid himself in 1881, was reopened in 1900, and a network of secondary, primary, and military schools was extended throughout the empire. Railway and telegraph systems were developed by primarily German firms. Between 1871 and 1908, the Sublime Porte thus "reached a new degree of organizational elaboration and articulation." Abroad, Abdul Hamid was nicknamed the Red Sultan or Abdul the Damned due to the massacres committed against minorities during his rule and use of a secret police to silence dissent and republicanism. These led to an assassination attempt in 1905, contributing to the sultan's worsening paranoia until his eventual removal from the throne. Abdul Hamid II as a Şehzade (Prince) in Balmoral Castle, Scotland, 1867. Abdul Hamid II was born at the Topkapı Palace in Istanbul (Constantinople), the capital of the Ottoman Empire, on 21 September 1842. He was the son of Sultan Abdülmecid and Tirimüjgan Kadınefendi (Circassia, 16 August 1819 – Beylerbeyi Palace, 2 November 1853), originally named Virjin. After the death of his mother, he later became the adoptive son of his father's wife, Valide Sultan Rahime Perestu. He was a skilled carpenter and personally crafted some high quality furniture, which can be seen today at the Yıldız Palace, Sale Kosku and Beylerbeyi Palace in Istanbul. Abdul Hamid II was also interested in opera and personally wrote the first-ever Turkish translations of many opera classics. He also composed several opera pieces for the Mızıka-yı Hümâyun (Ottoman Imperial Band/Orchestra, which was established by his grandfather Mahmud II who had appointed Donizetti Pasha as its Instructor General in 1828), and hosted the famous performers of Europe at the Opera House of Yıldız Palace, which was restored in the 1990s and featured in the film Harem Suare (1999) of the Turkish-Italian director Ferzan Özpetek (the film begins with the scene of Abdul Hamid II watching a performance.) Unlike many other Ottoman sultans, Abdul Hamid II traveled to distant countries. Nine years before he took the throne, he accompanied his uncle Sultan Abdülaziz on his visit to Paris (30 June – 10 July 1867), London (12–23 July 1867), Vienna (28–30 July 1867) and the capitals or cities of a number of other European countries in the summer of 1867 (they departed from Istanbul on 21 June 1867 and returned on 7 August 1867). He ascended to the throne following the deposition of his brother Murad on 31 August 1876. 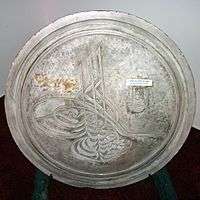 At his accession, some commentators were impressed by the fact that he rode practically unattended to the Eyüp Sultan Mosque where he was given the Sword of Osman. Most people expected Abdul Hamid II to have liberal ideas, and some conservatives were inclined to regard him with suspicion as a dangerous reformer. He did not plan and express any goal in his accession speech, however he worked with the Young Ottomans to realize some form of constitutional arrangements This new form in its theoretical space could help to realize a liberal transition with Islamic arguments, which could balance the Tanzimat's imitation of western norms. The political structure of western norms did not work with the centuries-old Ottoman political culture, even if the pressure from the Western world was enormous to adapt western ways of political decision. 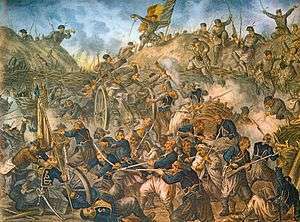 On 23 December 1876, under the shadow of the 1875 insurrection in Bosnia and Herzegovina, the war with Serbia and Montenegro and the feeling aroused throughout Europe by the cruelty used in stamping out the Bulgarian rebellion, he promulgated the constitution and its parliament. 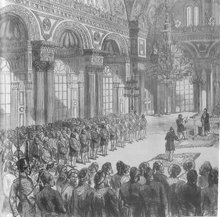 The international Constantinople Conference which met at Constantinople towards the end of 1876 was surprised by the promulgation of a constitution, but European powers at the conference rejected the constitution as a significant change; they preferred the 1856 constitution, the Hatt-ı Hümayun and 1839 Hatt-ı Şerif of Gülhane, but questioned whether there was need for a parliament to act as an official voice of the people. In any event, like many other would-be reforms of the Ottoman Empire change proved to be nearly impossible. Russia continued to mobilize for war. However, everything changed when the British fleet approached the capital from the Sea of Marmara. Early in 1877 the Ottoman Empire went to war with the Russian Empire. Abdul Hamid's biggest fear, near dissolution, was realised with the Russian declaration of war on 24 April 1877. In that conflict, the Ottoman Empire fought without help from European allies. Russian chancellor Prince Gorchakov had effectively purchased Austrian neutrality with the Reichstadt Agreement. The British Empire, though still fearing the Russian threat to British dominance in Southern Asia, did not involve itself in the conflict because of public opinion against the Ottomans, following reports of Ottoman brutality in putting down the Bulgarian uprising. The Russian victory was quickly realised. The conflict ended in February 1878. The Treaty of San Stefano, signed at the end of the war, imposed harsh terms: the Ottoman Empire gave independence to Romania, Serbia, and Montenegro; it granted autonomy to Bulgaria; instituted reforms in Bosnia and Herzegovina; and ceded parts of Dobrudzha to Romania and parts of Armenia to Russia, which was also paid an enormous indemnity. After the war with Russia, Abdulhamid suspended the constitution in February 1878, and he also dismissed the parliament after its solitary meeting in March 1877. For the next three decades, the Ottoman Empire was ruled by Abdulhamid from Yıldız Palace. As Russia could dominate the newly independent states, her influence in South-eastern Europe was greatly increased by the Treaty of San Stefano. Due to the insistence of the Great Powers (especially the United Kingdom), the treaty was later revised at the Congress of Berlin so as to reduce the great advantages acquired by Russia. In exchange of these favours, Cyprus was "rented" to Britain in 1878. There were troubles in Egypt, where a discredited khedive had to be deposed. Abdul Hamid mishandled relations with Urabi Pasha, and as a result Great Britain gained virtual control over Egypt and Sudan by sending its troops in 1882 with the pretext of "bringing order" to those provinces. Cyprus, Egypt and Sudan remained as Ottoman provinces "on paper" until 1914, when Britain officially annexed those territories in response to the Ottoman participation in World War I on the side of the Central Powers. The union in 1885 of Bulgaria with Eastern Rumelia was another blow. The creation of an independent and powerful Bulgaria was viewed as a serious threat to the Ottoman Empire. For many years Abdul Hamid had to deal with Bulgaria in a way that did not antagonise either Russian or German wishes. Starting around 1890, Armenians began demanding the implementation of the reforms which were promised to them at the Berlin conference. To prevent such measures, in 1890-91, Sultan Abdul Hamid gave semi-official status to the Kurdish bandits who were already actively maltreating the Armenians in the provinces. 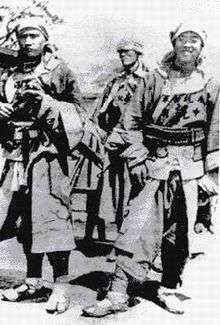 Made up of Kurds (as well as other ethnic groups such as Turcomans), and armed by the state, they came to be called the Hamidiye Alaylari ("Hamidian Regiments"). 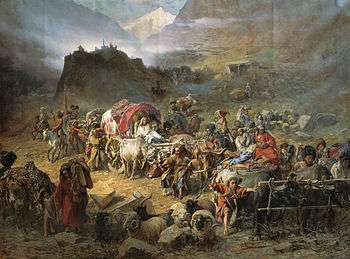 The Hamidiye and Kurdish brigands were given free rein to attack Armenians, confiscating stores of grain, foodstuffs, and driving off livestock, and confident of escaping punishment as they were subject only to courts martial. In the face of such violence, the Armenians established revolutionary organizations, namely the Social Democrat Hunchakian Party (Hunchak; founded in Switzerland in 1887) and the Armenian Revolutionary Federation (the ARF or Dashnaktsutiun, founded in 1890 in Tiflis). Clashes ensued and unrest occurred in 1892 at Merzifon and in 1893 at Tokat. 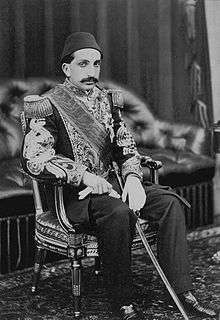 Abdul Hamid II did not hesitate to put down these revolts with harsh methods, possibly to show the unshakable power of the monarch, while using the local Muslims (in most cases Kurds) against the Armenians. As a result of such violence, 300,000 Armenians were killed in what became known as the Hamidian massacres. News of the Armenian massacres were widely reported in Europe and the United States and drew strong responses from foreign governments and humanitarian organizations alike. Hence, Abdul Hamid II was referred to as the "Bloody Sultan" or "Red Sultan" in the West. On 21 July 1905, the Armenian Revolutionary Federation attempted to assassinate him with a car bombing during a public appearance, but the Sultan was delayed for a minute and the bomb went off early, killing 26, wounding 58 (of which four died at hospital) and demolishing 17 cars in the process. This continued aggression, along with the handling of the Armenian desire for reforms, led to the western European powers taking a more hands-on approach with the Turks. Sultan Abdul Hamid II, after being approached by American minister to Turkey, Oscar Straus, sent a letter to the Moros of the Sulu Sultanate telling them not to resist American takeover and cooperate with the Americans at the start of the Moro Rebellion. The Sulu Moros complied with the order. The Triple Entente – that is, the United Kingdom, France and Russia – maintained strained relations with the Ottoman Empire. Abdul Hamid and his close advisors believed the empire should be treated as an equal player by these great powers. In the Sultan's view, the Ottoman Empire was a European empire, distinct for having more Muslims than Christians. Abdul Hamid and his divan viewed themselves as modern. However, their actions were often construed by Europeans as exotic or uncivilized. German government officials were brought in to reorganise the Ottoman government's finances. Abdul Hamid tried to take more of the reins of power into his own hands, for he mistrusted his ministers. Germany's friendship was not altruistic; it had to be fostered with railway and loan concessions. In 1899, a significant German desire, the construction of a Berlin-Baghdad railway, was granted. Abdul Hamid was paranoid about his security. The memory of the deposition of Abdul Aziz I was on his mind and convinced him that a constitutional government was not a good idea. Because of this, information was tightly controlled and the press was tightly censored. The curriculum of schools was subject to close inspection to prevent dissidence. Ironically, the schools that Abdul Hamid tried to control became "breeding grounds of discontent" as students and teachers alike chafed at the clumsy restrictions of the censors. Abdul Hamid’s reign also had a fully functioning state spy system. These spies greatly impeded the operation of the state administration as officials were constantly concerned that a false report would be filed against them. In Spies, Scandals and Sultans, by Ibrahim Al-Muwaylihi, it is recounted how spies were operating all across Constantinople and that even the Shaykh al-Islam was paralyzed with fear of these spies. Additionally, al-Muwaylihi described how many spies followed the carriage of the Crown Prince. Overall, these spies hampered the functioning of the state and potential reform ideas as people were afraid of being reported. As he got older, Abdul Hamid became increasingly isolated and paranoid. He was afraid of having any organisation or individual impinge on his level of power. In response to this fear, he began underfunding the army and further restricting political and civil rights, helping to spark the Young Turk Revolution (initiated by the Third Army) in 1908. Most people expected Abdul Hamid II to have liberal ideas, and some conservatives were inclined to regard him with suspicion as a dangerous reformer. However, despite working with the reformist Young Ottomans while still a crown prince and appearing as a liberal leader, he became increasingly conservative immediately after taking the throne. Default in the public funds, an empty treasury, the 1875 insurrection in Bosnia and Herzegovina, the war with Serbia and Montenegro, and the feeling aroused throughout Europe by the Abdul Hamid government's cruelty in stamping out the Bulgarian rebellion all contributed to his apprehension for enacting significant changes. His push for education resulted in the establishment of 18 professional schools, and in 1900, Darulfunun, aka the University of Istanbul, was established. He also created a large system of secondary, primary, and military schools throughout the empire. 51 secondary schools were constructed in a 12-year period (1882–1894). As the goal of the educational reforms in the Hamidian era were to counter foreign influence, these secondary schools utilized European teaching techniques, yet instilled within students a strong sense of Ottoman identity, "Islamic morality", and loyalty to the sultan. The primary goal of these educational reforms was to Ottoman-ize the education system and thereby the student citizenry. 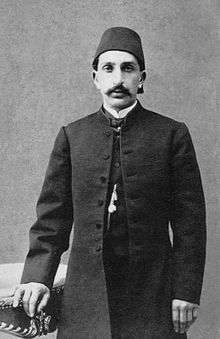 Abdul Hamid also reorganized the Ministry of Justice and developed rail and telegraph systems. The telegraph system expanded to incorporate the furthest parts of Empire. Railways connected Istanbul and Vienna by 1883, and shortly afterwards the Orient Express connected Paris to Istanbul. During his rule, railways within the Ottoman Empire expanded to connect Ottoman-controlled Europe and Anatolia with Istanbul as well. The increased ability to travel and communicate within the Ottoman Empire served to strengthen Istanbul's influence over the rest of the Empire. Abdul Hamid believed that the ideas of Tanzimat could not bring the disparate peoples of the empire to a common identity, such as Ottomanism. He tried to formulate a new ideological principle, Pan-Islamism; since Ottoman sultans beginning with 1517 were also nominally Caliphs, he wanted to promote that fact and emphasized the Ottoman Caliphate. Abdul Hamid usually resisted the pressure of the European powers to the last moment, in order to seem to yield only to overwhelming force and to appear as the champion of Islam against aggressive Christendom. Pan-Islamism was encouraged; the privileges of foreigners in the Ottoman Empire, which were often seen as an obstacle to effective government, were curtailed. Along with the strategically important Constantinople-Baghdad Railway, the Constantinople-Medina Railway was also completed, making the trip to Mecca for Hajj more efficient. Missionaries were sent to distant countries preaching Islam and the Caliph's supremacy. During his rule, Abdul Hamid refused Theodor Herzl's offers to pay down a substantial portion of the Ottoman debt (150 million pounds sterling in gold) in exchange for a charter allowing the Zionists to settle in Palestine. He is famously quoted with telling Herzel's emissary "as long as I am alive, I will not have our body divided, only our corpse they can divide." Abdul Hamid's appeals to Muslim sentiment were not very effective due to widespread disaffection within the Empire. In Mesopotamia and Yemen disturbance was endemic; nearer home, a semblance of loyalty was maintained in the army and among the Muslim population only by a system of deflation and espionage. After his rule began, Abdul Hamid became fearful of being assassinated and withdrew himself into the fortified seclusion of the Yıldız Palace. Fearful of assassination, Abdul Hamid II did not travel often (though still more than many previous rulers). Photographs provided visual evidence of what was taking place in his realm. He commissioned thousands of photographs of his empire including from the Constantinople studio of Jean Pascal Sébah. The Sultan presented large gift albums of photographs to various governments and heads of state, including the United States and Great Britain. The American collection is housed in the Library of Congress and has been digitized. Abdul Hamid II was born at Çırağan Palace, Ortaköy, or at Topkapı Palace, both in Constantinople, the son of Sultan Abdülmecid I and one of his many wives, Tîr-î-Müjgan Sultan, (Circassia, 16 August 1819 – Constantinople, Feriye Palace, 2 November 1853). He later also became the adoptive son of another of his father's wives, Valide Sultan Rahime Perestu. He was a skilled carpenter and personally crafted most of his own furniture, which can be seen today at the Yıldız Palace and Beylerbeyi Palace in Constantinople. Abdul Hamid II was also interested in opera and personally wrote the first-ever Turkish translations of many opera classics. He also composed several opera pieces for the Mızıka-ı Hümayun which he established, and hosted the famous performers of Europe at the Opera House of Yıldız Palace which was recently restored and featured in the film Harem Suare (1999) of the Turkish-Italian director Ferzan Özpetek, which begins with the scene of Abdul Hamid II watching a performance. He was also a fan of the actress Sarah Bernhardt, and he brought her to his private theatre on numerous occasions. He was also a good wrestler of Yağlı güreş and a 'patron saint' of the wrestlers. He organised wrestling tournaments in the empire and selected wrestlers were invited to the palace. Abdul Hamid personally tried the sportsmen and good ones remained in the palace. Sultan Abdul Hamid II was a practitioner of traditional Islamic spirituality. He was influenced by Libyan Shadhili Madani sheikh, Muhammad Zafir al-Madani whose lessons he would attend in disguise in Unkapani before he became Sultan. Abdul Hamid II asked Sheikh al-Madani to return to Istanbul after he ascended the throne. The sheikh initiated Shadhili gatherings of remembrance (dhikr) in the newly commissioned Yıldız Hamidiye Mosque; on Thursday evenings he would accompany Sufi masters in reciting dhikr. He also became a close religious and political confidant of the Sultan. In 1879 the Sultan excused the taxes of all of the Caliphate's Madani Sufi lodges (also known as zawiyas and tekkes). 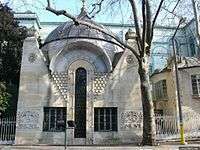 In 1888, he even established a Sufi lodge for the Madani order of Shadhili Sufism in Istanbul, which he commissioned as part of the Ertuğrul Tekke mosque. The relationship of the Sultan and the sheikh lasted for thirty years until the latter's death in 1903. Abdul Hamid II had thirteen wives and seventeen children. Circassian HIM Empress Nurefsun Kadın alias Safinaz (née Ayşe Şermet, c. 1851 – 1915), married at Istanbul, Dolmabahçe Palace in October 1868 and divorced on 26 July 1879, daughter of Selim Bey Şermat by his wife Princess Rebiye Hanım. HIH Prince Şehzade Mehmed Selim Osmanoğlu (Istanbul, Beşiktaş, Beşiktaş Palace 11 January 1870 – Beirut, 4 May 1937 and buried in Damascus), married at Constantinople, Yıldız Palace, on 4 June 1886 to Abkhazian Eryale Hanım (Sukhumi, Abkhazia, 10 February 1870 – Istanbul, Yıldız Palace, 27 December 1904), daughter Prince Ali Hasan Bey Marshania by his wife Princess Fatma Horecan Aredba, and had a son and a daughter, married secondly at Istambul, Yıldız Palace, Eflakyar Hanım, (Batumi, Georgia, ? – Beirut, 1930), daughter of Gazi Muhammed Bey, without issue, married thirdly Istanbul, Yıldız Palace, on 30 June 1905 to Nilüfer Hanım (Artvin, 1 May 1887 – 23 August 1943) married fourthly at Istanbul, Yıldız Palace, on 29 March 1910 to Pervin Dürrüyekta Hanım (Adapazarı, 6 June 1894 – Lebanon, 1969 and buried there), daughter of Prince Zekeriya Bey Karzeg by his wife Şadiye Hanım, married fifthly at Istanbul, Yıldız Palace to Gülnaz Hanım, without issue, married sixthly at Sivas on 16 September 1918 to Dilistan Leman Hanım (? – Beirut, Lebanon, 1 February 1951 and buried there), daughter of Osman Bey, an Abkhazian, by his wife Mevlüde Hanım, without issue. HIH Princess Zekiye Sultan (Dolmabahçe Palace, 21 January 1872 – Pau, 13 July 1950 and buried there), married at Constantinople, Yıldız Palace, on 20 April 1889 to HE Damat Ali Nureddin Pasha Beyefendi (1867–1953), created Damat in 1889, and had issue. HIH Prince Şehzade Ahmed Nuri (Istanbul, Yıldız Palace, 11 February 1878 – Nice, August 1944), married firstly at Istanbul, Yıldız Palace, in 1900 to Fahriye Hanım (Istanbul, 1883 – Nice, 1940 and buried in Damascus), daughter of a Circassian Bey, lieutenant colonel in the Imperial Ottoman Army, without issue, married secondly at Istanbul, Raşel Hanım, a Jewish lady from Istanbul, without issue. HIH Princess Naime Sultan (Istambul, Yıldız Palace, 4 September 1875 – Tirana, 1945), married at Istanbul, Ortaköy, Ortaköy Palace, on 17 March 1898 and divorced in 1904 HE Damat Mehmed Kemaleddin Pasha Beyefendi (1869–1920), created Damat in 1898, married secondly on 11 July 1907 Mahmud Celaleddin (1874–1944), and had issue. HIH Prince Şehzade Mehmed Abdülkadir (Constantinople, Beşiktaş, Dolmabahçe Palace, 16 January 1878 – Sofia, January or 16 March 1944 and buried there), Captain of the Ottoman Army, married firstly at Constantinople, Yıldız Palace, in 1898, to Mislimelek Hanım, née Pakize Marşania, daughter of Prince Abdülkadir Bey Maşan by his wife Princess Mevlüde Hanım İnalipa, married secondly at Constantinople, Yıldız Palace, and divorced, to Sühendan Hanım (born Tokat), married thirdly at Istanbul, Yıldız Palace, on 6 June 1907 to Mihriban Hanım (Constantinople, 18 May 1890 – Cairo, 1956) and had one son, married fourthly at Kızıltoprak, Asia Minor, on 1 June 1913 and divorced in 1934 to Hadice Macide Hanım (Adapazarı, 14 September 1899 – Vienna, 1934 and buried there), daughter of Mustafa Şerif Bey, Colonel in the Imperial Ottoman Army, and had one son, married fifthly at Kızıltoprak, Asia Minor, on 5 February 1916 to Meziyet Fatma Hanım (İzmit, 17 February 1902 – Istanbul, 13 November 1989), daughter of Mecid Bey, Colonel in the Imperial Ottoman Army, and had one son and two daughters, and married sixthly in Budapest on 4 July 1924 to Irene Mer Hanım, and had one son. HIH Princess Naile Sultan (Constantinople, Yıldız Palace, 9 January 1884 – Erenköy, Asia Minor, 25 October 1957), married at the Kurucheshme Palace, 27 February 1905, to HH Damat Arif Hikmat Pasha Germiyanoglu (Prizrin, 16 December 1872 – Beirut, 23 April 1942), sometime Senator and Minister for Justice, third son of HH Haji Abdurrahman Nureddin Pasha, sometime Grand Vizier. HIH Prince Şehzade Mehmed Burhaneddin Efendi (Istanbul, Yıldız Palace, 19 December 1885 – New York City, 15 June 1949 and buried in Damascus), Captain of the Ottoman Army, Titular King of Albania in 1914, married firstly in 1908 Hidayet Hanım, alias Nurbanu, née Emine Açba, daughter of Prince Mehmed Refik Bey Açba by his wife Princess Emine Mahşeref Hanım Emuhvari, and had a son, married secondly at Nişantaşı Palace, Pera (today Beyoğlu), on 7 June 1909 and divorced in 1919 Aliyemelek Nazlıyar Hanım (Adapazarı, 13 October 1892 – Ankara, 31 August 1976), daughter of Huseyin Bey, educated at Theresian Military Academy, Vienna, and École des Sciences Politiques, Paris, and had a son, married thirdly in Paris on 29 April 1925 and divorced in 1925 Dutch Georgina Leonora Barnard Mosselmans (Bergen op Zoom, 23 August 1900 – 1969), daughter of Richard Frederick Hendrik Mosselmans and wife (who married secondly on 1 March 1926 to Fernand Comte Bertier de Sauvigny and thirdly on 18 August 1933 to Lord Sholto George Douglas (7 June 1872 – 6 April 1942), former husband of Loretta Mooney and son of the 9th Marquess of Queensberry), and married fourthly in London, Middlesex, on 3 July 1933 to Elsie Deming Jackson (New York City, 6 September 1879 – New York City, 12 May 1952). HIH Princess Şadiye Sultan (Istanbul, Yıldız Palace, 30 November 1886 – 20 November 1977), married firstly at Istanbul, Nishantashi Palace on 3 December 1910, to Damat Fahir Bey (1882 – 27 September 1922, Istanbul, Nishantashi Palace), and had one daughter, married secondly in Paris, France on 28 October 1931 to Damat Reshad Halis (1885, Istanbul - died ?, November, 1944, Paris) without issue. HIH Princess Hamide Ayşe Sultan (Istanbul, Yıldız Palace, 31 October 1887 – 11 August 1960), married at Nişantaşı, Nişantaşı Palace, Pera (today Beyoğlu), on 3 April 1921 to HE Damat Mushir Mehmed Ali Rauf Nami Pashazade Beyefendi (Istanbul, 1877 – Viroflay, Yvelines, 21 September 1937 and buried in Paris at Bobigny Cemetery, and had issue. HIH Princess Refia Sultan (Istanbul, Yıldız Palace, 15 June 1891 – Beirut, 1938; Beirut, Lebanon, buried in Damascus [Sultan Selim Mosque], Syria), married 3 Sept. 1910 in Kiziltoprak Sarayi to Ali Fuad Bey, son of Ahmet Eyüb Pasha, and had issue. HIH Prince Şehzade Abdurrahim Hayri Efendi (Istanbul, Yıldız Palace, 14 August 1894 – Paris, 1 June 1952), married firstly at Nişantaşı Palace, Pera (today Beyoğlu), on 4 June 1919 and divorced in 1923 HH Nabila Emine Halim Hanım (Constantinople, 1 June 1899 – Istanbul, 6 December 1979), daughter of Prince Mehmed Abbas Halim Pasha, by his wife Princess Fahrünnisa Hatice Hanım, second daughter of Mehmed Tewfik Pasha, Khedive of Egypt, and had one daughter, married secondly at Istanbul to Misalruh Hanım (? - c. 1955, Nice, France, buried in Muslim Bobigny cemetery), alias Mihrişah, née Feride, daughter of Mehmed Bey by his wife Emine Hanım, without issue. HIH Prince Şehzade Ahmed Nureddin (Istanbul, Yıldız Palace, 12 June 1900 – 2 June 1945, buried at the Islamic cemetery of Bobigny near Paris), married at Maslak, Bosphorus, on 5 May 1919 to Ayşe Andelib Hanım (Adapazarı, 8 August 1902 – ? ), daughter of Hüsnü Paşa, Aide-de-camp to Sultan Abdul Hamid II, by his wife Kudsiye Hanım, without issue. HIH Prince Şehzade Mehmed Abid (Istanbul, Yıldız Palace, 17 September 1905 – Beirut, 8 December 1973 and buried in Damascus), married firstly to Pınardil Fahriye Hanım (? - c. 1934 Nice, France, buried in Muslim Bobigny Cemetery), without issue, married secondly in Tirana on 12 January 1936 and divorced in 1949 Princess Senije Zogu (Mati, 15 November 1908 – Cannes, 15 April 1969), sister of King Zog I, without issue. A translation of Riza Tevfik Bölükbaşı's poem called "Istimdad" on Sultan Abdulhamid Han II. Riza Tevfik was a member of the Committee of Union and Progress, which dethroned Sultan Abdulhamid Han II. Where are you my glorious Sultan Hamid Han? Does my lamentation reach your presence? From where have all these traitors come? Riza Tevfik Bölükbaşı - "Istimdad"
1 2 3 4 5 6 7 8 9 10 11 12 Hoiberg, Dale H., ed. (2010). "Abdulhamid II". Encyclopedia Britannica. I: A-ak Bayes (15th ed.). Chicago, IL: Encyclopedia Britannica Inc. p. 22. ISBN 978-1-59339-837-8. 1 2 3 "Abdulhamid II | biography - Ottoman sultan". Retrieved 2015-09-29. 1 2 "Sultan beaten, capital falls, 6,000 are slain". The New York Times. 25 April 1909. ↑ "Abdul Hamid II Collection -About this Collection- Prints & Photographs Online Catalog (Library of Congress)". www.loc.gov. Retrieved 2015-09-30. ↑ Vahan Hamamdjian (2004). Vahan's Triumph: Autobiography of an Adolescent Survivor of the Armenian Genocide. iUniverse. p. 11. ISBN 978-0-595-29381-0. ↑ Razmik Panossian (13 August 2013). The Armenians: From Kings and Priests to Merchants and Commissars. Columbia University Press. p. 165. ISBN 978-0-231-13926-7. ↑ "Sultan Abdülaziz - Avrupa Seyahati". blog.milliyet.com.tr. ↑ McDowall, David (2004). A Modern History of the Kurds, 3rd rev. and updated ed. London: I.B. Tauris, pp. 60-62. ↑ Nalbandian, Louise (1963). The Armenian Revolutionary Movement: The Development of Armenian Political Parties through the Nineteenth Century. Berkeley: University of California Press. ↑ "Constitutional Rights Foundation". Cfr-usa.org. ↑ Kemal H. Karpat (2001). The Politicization of Islam: Reconstructing Identity, State, Faith, and Community in the Late Ottoman State. Oxford University Press. pp. 235–. ISBN 978-0-19-513618-0. ↑ Akyol, Mustafa (2006-12-26). "Mustafa Akyol: Remembering Abdul Hamid II, a pro-American caliph". Weekly Standard. History News Network. ↑ ERASMUS (Jul 26, 2016). "Why European Islam's current problems might reflect a 100-year-old mistake". The Economist. ↑ Kemal H. Karpat (2001). The politicisation of Islam: reconstructing identity, state, faith, and community in the late Ottoman state. Oxford University Press US. p. 237. ISBN 0195136187. Retrieved 28 June 2010. The Spectator, Volume 87. F.C. Westley. 1902. p. 243. Retrieved 1 April 2013. Harris, Lillian Craig (1993). China Considers the Middle East (illustrated ed.). I. B. Tauris. p. 56. ISBN 1850435987. Retrieved 1 April 2013. "The official Russian announcement that...". The Straits Times. 10 July 1901. p. 2. Retrieved 1 April 2013. The Moslem World, Volumes 1-3. Contributor Hartford Seminary Foundation. Hartford Seminary Foundation. 1966. p. 190. Retrieved 1 April 2013. ↑ Robert A. Bickers (2007). The Boxers, China, and the World. Rowman & Littlefield. pp. 150–. ISBN 978-0-7425-5395-8. 1 2 3 4 5 6 One or more of the preceding sentences incorporates text from a publication now in the public domain: Chisholm, Hugh, ed. (1911). "Abd-ul-Hamid II". Encyclopædia Britannica. 1 (11th ed.). Cambridge University Press. p. 36. ↑ Creelman, James (22 August 1909). "The Slaughter of Christians in Asia Minor". The New York Times. 1 2 Cleveland, William; Burton, Martin (2013). A History of the Modern Middle East. Boulder, CO: Westview Press. pp. 123–124. ISBN 978-0-8133-4833-9. ↑ "Turkish Naval History: The Period of the Navy Ministry". Dzkk.tsk.mil.tr. 1 2 Cleveland, William L. (2008)"History of the Modern Middle East" (4th ed.) pg.121. ↑ "עניין היהודים", (יומני הרצל). הוצאת מוסד ביאליק. p. 332. את הדברים אמר הסולטאן לשליחו של הרצל (נוולינסקי) ב-19 ביוני 1896. מקור - "עניין היהודים", (יומני הרצל) - הוצאת מוסד ביאליק, כרך א' עמוד 332. הרצל עצמו נפגש עם הסולטאן רק ב-17 במאי 1901, ללא הישגים נוספים. ↑ William Allen, "The Abdul Hamid II Collection," History of Photography eight (1984): 119–45. ↑ "Ottoman Empire photographs". Library of Congress. ↑ "Turkish Royalty". Ancestry. Retrieved 2012-11-29. ↑ "Osmanlı İmparatorluğu Türk Sultanları". Osmanlı Araştırmaları Vakfı. Retrieved 2012-11-29. 1 2 "The Ottoman caliphate: Worldly, pluralist, hedonistic—and Muslim, too". The Economist. 19 December 2015. Retrieved 26 December 2015. ↑ "Sheikh Mohammed Zafir". Madani86.blogspot.com. ↑ Minkus New World-Wide Stamp Catalog (1974–75 ed. ), Turkey, note preceding no. 144. 1 2 3 4 5 6 7 8 9 10 11 12 Harun Açba (2007). Kadın efendiler: 1839-1924. Profil. ISBN 978-9-759-96109-1. ↑ Effendi, Ayberk (2011). Lions of the golden apple. Germany: Haqqbutler. pp. 167–170. Akarli, Engin D. (2001). "The Tangled Ends of an Empire and Its Sultan". In Leila Tarazi Fawaz and C. A. Bayly (eds.). Modernity and Culture: From the Mediterranean to the Indian Ocean. New York: Columbia University Press. pp. 261–284. ISBN 978-0-231-11426-4. Pears, Sir E. (1917). Life of Abdul-Hamid. University of California. "Abdul-Hamid II.". Collier's New Encyclopedia. 1921.